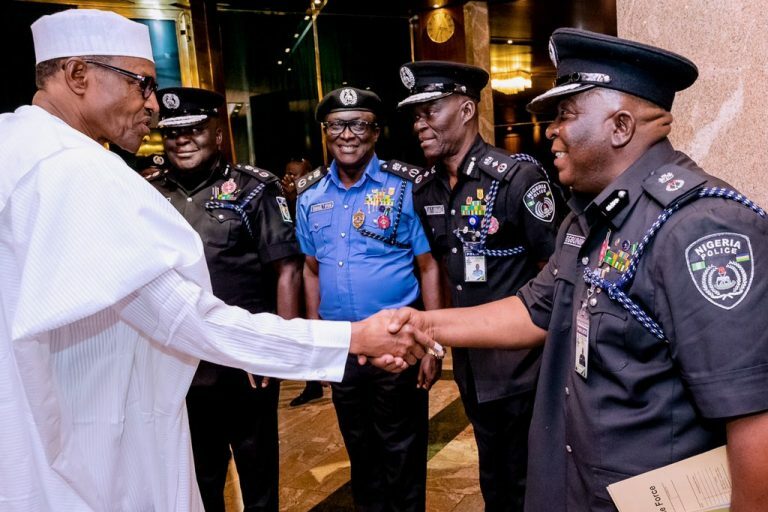 By Sadiq Umar – President Muhammadu Buhari Monday assured that his administration would continue to give attention to the welfare and operational needs of the Nigeria Police Force (NPF) with a view to restoring its lost primacy in the internal security framework of the country. Mr. Buhari said an increment in salary and allowances of the Nigerian Police would increase the performance index of the police and strengthen Nigeria’s internal security system. The President spoke during an audience with members of the Nigeria Police Service Commission and the leadership of the Nigeria Police Force at the State House, Abuja. The Commission’s leadership were on a “Thank You” visit following Mr. Buhari’s approval of Rank Salary Structure Adjustment, by which salary, allowances and pension of policemen will be increased. Presidential spokesman, Garba Shehu, said in a statement that Mr. Buhari regretted that the inability of the police in their constitutional role as the frontline force in the prevention of crime, had led to military involvement in the maintenance of law and order throughout the country. President Buhari observed that the more efficient the police is, the more confident the government and citizens will be. “There is a need to amplify the question of more men of the police, especially given the condition we are in – emergency in the North-East, pervasive insecurity and abduction for ransom and banditry in many parts of the country. I congratulate you on the success you recorded against criminals taxing people and stopping them from their farms. We are expecting more from you,” the President told the police. Full-time Commissioner in the Nigeria Police Service Commission, Justice Clara Ogunbiyi (rtd), who represented the chairman, Musiliu Smith, had informed the President that the Rank Salary Structure Adjustment would enhance police welfare and morale. The Inspector General of Police, Ibrahim Idris, also assured that the police would redouble efforts to ensure free, fair and credible elections throughout the country next year.